Nicky Dou was born and raised in Springdale, Arkansas and has resided within Northwest Arkansas for over 36 years. A valedictorian graduate of Springdale High School, she was actively involved in sports, cheerleading, student leadership programs and was Homecoming queen. She also holds a Bachelor of Art's degree from the University of Arkansas, Fayetteville, where she was an active member of the Zeta Tau Alpha sorority. Nicky and her husband Jerry enjoy a wide variety of what this area has to offer. Whether its boating on Beaver Lake, riding ATV's and camping in the Ozark National Forest, enjoying Dickson Street's live music, enjoying Crystal Bridges Art Museum or attending an Arkansas Razorback athletic event, these are the countless reason why Nicky and Jerry call Northwest Arkansas home. In Nicky's professional career, she strides to be the best in selling real estate while providing superior customer attention and service. Nicky "thinks outside the box" and has a passion for real estate and marketing. Nicky was #1 Century 21 Realtor in Northwest Arkansas (2008-2012) and was the #1 for the entire state of Arkansas in 2008, 2009 and #2 in 2010, 2011 & 2012. Ask anyone in the real estate industry in Northwest Arkansas and they will tell you Nicky Dou is "the marketing/technology expert - for real estate in Northwest Arkansas". In 2013 Nicky ranked #8 out of over 3000 Realtors in Northwest Arkansas. Nicky also enjoys photography, painting, decorating (which helps tremendously in helping sellers get their Northwest Arkansas home ready to sell). 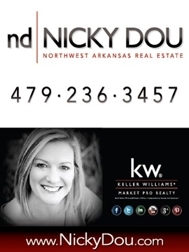 Give Nicky a call or send her an email today if you are thinking about buying or selling your Northwest Arkansas HOME! Nicky began her career in Real Estate back in 2001 at Harris McHaney Realtors. She climbed to the top sales agent position in her office quickly and decided to start up her own company. Nicky and Jerry Dou owned and operated "Element Realty Group" for just over 2 years in the Northwest Arkansas area. Although she loved running her own company - it really took her away from her true passion - working with her clients and selling & marketing homes! In November of 2007 Nicky joined forces with Coldwell Banker Faucette Real Estate where she was ranked the #1 Coldwell Banker agent in the State of Arkansas while she was with them; in 2008 Nicky joined Century 21 Exclamation Realty - located at Village on the Creeks in Rogers until February 2013 when Century 21 & Coldwell Banker in Northwest Arkansas "merged companies". Nicky and her husband Jerry along with their full time assistant, Jerilyn made the move to Keller Williams Market Pro Realty in late 2013 and love it there. Nicky loves marketing and the KW model allows her to do just that - in her own style which has always stood out in this real estate market. Selling your home? Nicky utilizes a variety of marketing mediums to ensure her seller's homes are sold fast and for top dollar. Marketing the sale of your home is Nicky's primary goal. Nicky is always thinking of new ways to get more buyers in your home. Nicky invests a lot of time and money on internet marketing including making sure that her listings are found in search engines and on top of google. Not to worry, Nicky has this down to an art and you just need to leave it up to her to get the job done. Nicky utilizes INTERNET advertisement with best-in-class videos/virtual tour utilizing the popular "You Tube" website with video slideshows that Nicky directs and edits herself, e-brochures, and BEST THING - your home will be plastered all over the internet. Nicky loves to get your listing on the top of GOOGLE and other search engines... and quick! You will also find Nicky's listings are on FaceBook, Trulia, Google +, Pinterest, ActiveRain Blogs, Realtor.com featured listings as well as many other websites. YOUR HOME WILL GET MAXIMUM EXPOSURE IF YOU LIST WITH NICKY DOU! Call Nicky Dou with Keller Williams to set up an appointment to list your home today. Nicky only takes a certain number of listings/month & you want to be sure to have the very best working on your behalf! During the initial appointment Nicky will do a walk through and make suggestions on getting your home ready for the market. Nicky is an "Accredited Home Staging Specialist" and feels that in this business she feels that every home on the market could use some "staging". Once you are ready to go with the listing (once price has been established and listing agreement is signed) Nicky will spend a few hours staging your home using & rearranging your items (and might bring in a few of her own) and then take photos. Photos are very important and Nicky makes SURE that the photos will look their very best. Call for more details if you still have questions about Nicky's listing process. EMAIL NICKY NOW WITH YOUR HOME'S ADDRESS AND BEST TIME TO MEET to get started right away. Nicky takes her job very seriously and treats each home she lists as if it were her own and each buyer's investment/home as if it were her purchasing for her family. Whether it's finding your dream home in Northwest Arkansas or getting top dollar for your home, Nicky will ensure your goals and real estate needs are fulfilled. Nicky was told once, "if you find a career you love, you will never have to work a day in your life!" Nicky loves her job and would not trade it for another! For superior and professional real estate servicesin the Fayetteville, Springdale, Rogers, Bentonville, Bella Vista, or Beaver Lake area, please do not hesitate to call Nicky Dou 479.236.3457. You will be glad that you did! "THE BEST REALTOR IN ARKANSAS"